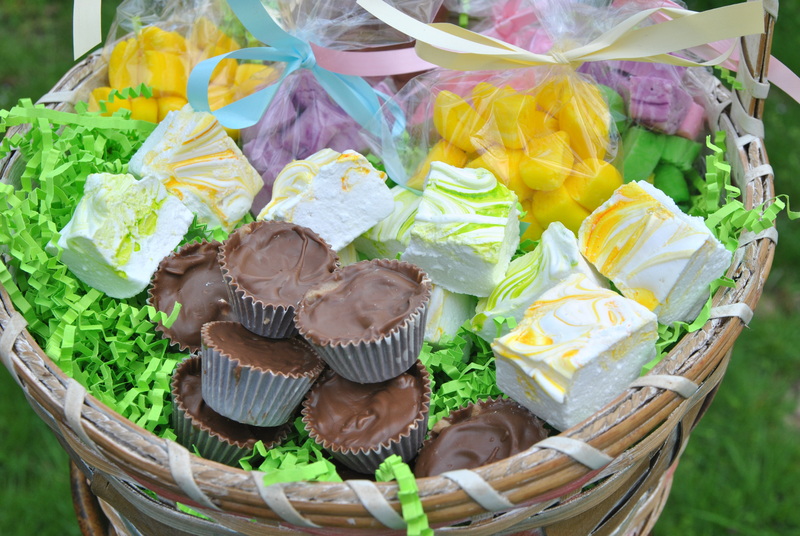 Most everyone hopes to find a few sweet treats tucked into their Easter basket along with the colored eggs and milk chocolate Easter bunny. In my house, for example, there’d be a whole lot of unhappy campers if the celebration didn’t include a whole lot of peanut butter cups and sugar-coated marshmallow Peeps. Yet who says you have to shop the candy aisle to satisfy your family’s sweet tooth? 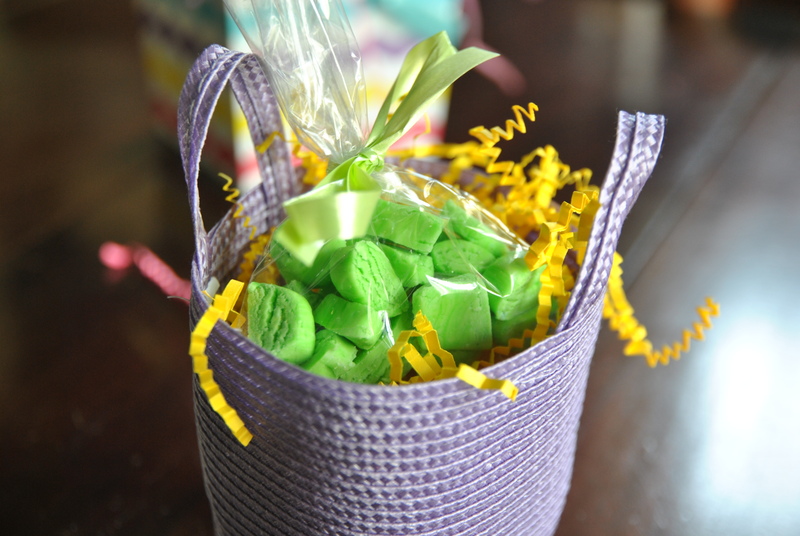 This year, why not surprise them with a few homemade Easter candies? It’s easier and faster than you might think. And it’ll taste better than the mass-produced goodies stacked high on grocery store shelves. Maybe it’s asking too much to forgo Peeps, which have been an Easter basket favorite since the first one rolled off the assembly line in 1953. But with just a small amount of effort, you can make your own flavored marshmallows and creamy, homemade peanut butter cups. 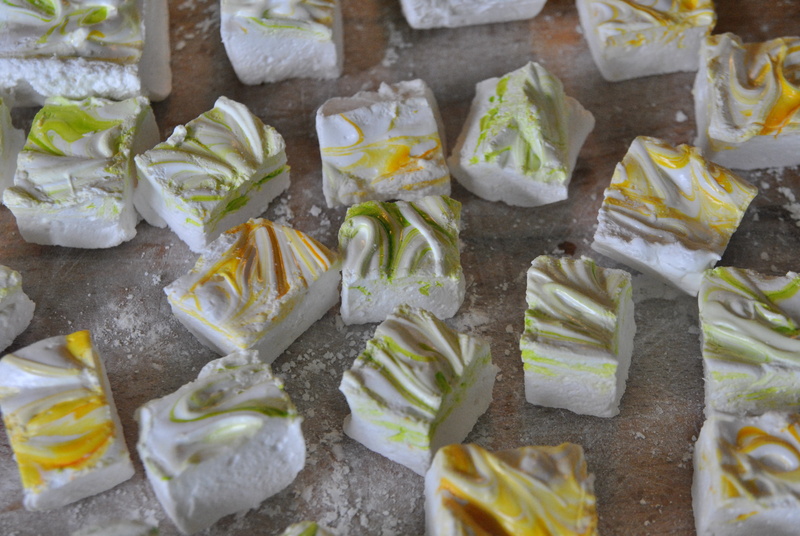 Easier still are butter mints — so easy, in fact, that even my teenagers, with virtually no help, whipped up four different colors. Peeps, schmeeps. These sweet, fluffy treats are just as good, and store in an airtight container at room temperature for up to 3 weeks. We paired lemon extract with green and yellow food coloring. Check the accuracy of your candy thermometer before starting. Generously grease bottom and sides of 11-by-7-inch glass baking dish with butter; dust with 1 tablespoon of powdered sugar. In bowl of stand mixer, sprinkle gelatin over 1/2 cup cold water to soften; set aside. In 2-quart saucepan, heat granulated sugar, corn syrup, salt and remaining 1/2 cup water over low heat, stirring constantly, until sugar is dissolved. Heat to boiling; cook uncovered about 30 minutes without stirring, to 240 degrees on candy thermometer or until small amount of mixture dropped into cup of very cold water forms a soft ball that flattens between fingers; remove from heat. Slowly pour syrup into softened gelatin while beating on low speed. Increase speed to high; beat 8 to 10 minutes or until mixture is white and has almost tripled in volume. Add extract; beat on high speed 1 minute. Pour into baking dish, patting lightly with wet hands. Drop food color randomly on top of marshmallow mixture. Pull table knife through food color to create swirl pattern over top. Let stand uncovered at least 8 hours or overnight. Dust cutting board with 1 tablespoon powdered sugar. Place remaining powdered sugar in small bowl. To remove marshmallow mixture, loosen sides from dish and gently lift in 1 piece onto cutting board. Using sharp knife greased with butter, cut into 1-inch squares (11 rows by 7 rows). Dust bottom and sides of each marshmallow by dipping into bowl of powdered sugar. These are super easy, but you have to fill the mini muffin liners just so — too much chocolate and there won’t be room for peanut butter, and not enough and they may break when you peel the candy out of the wrapper. Lay out 30 mini muffin liners (petits fours papers) on a large plate or baking sheet. Set up double boiler over medium heat. Melt chocolate in double boiler over medium heat, stirring as it melts, and when it is entirely smooth, 7 to 10 minutes, remove it from heat. Scoop up a bit of chocolate with a small spoon, pour it into a mini muffin liner and use the back of a spoon to spread the chocolate around the entire inside of the liner. You want the layer to be thin, but not so thin that it won’t hold up when it dries and gets peeled out of the paper. Repeat with remaining cups. Set them aside to harden a bit, 10 to 15 minutes, and wash spoon. Set aside the remaining melted chocolate. Meanwhile, make the filling. Combine peanut butter, vanilla, salt and brown sugar in bowl of a food processor fitted with the chopping blade. Process the mixture until it is smooth and uniform. Even if chocolate is not yet hard, with a small spoon, fill each cup 3/4 of the way with the peanut butter mixture. Return the double boiler to medium heat, and soften the remaining chocolate in the bowl. 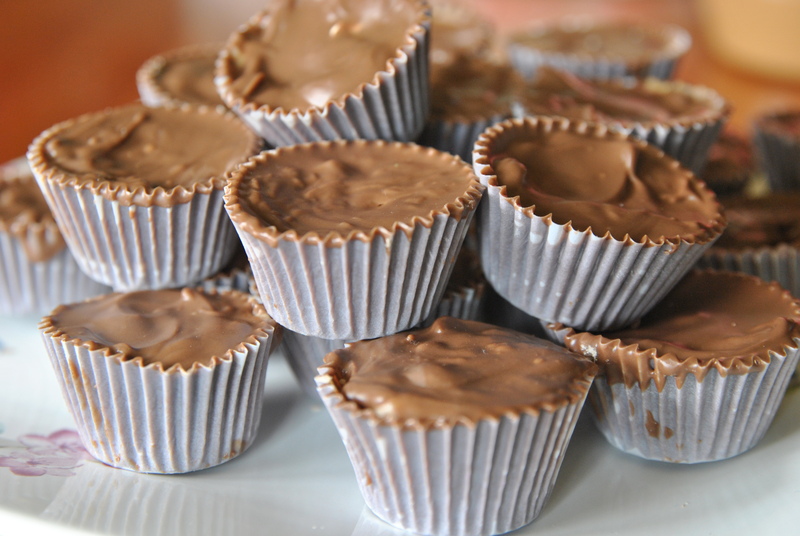 With a large spoon, cover peanut butter with melted chocolate to top of the cups to seal in filling. When all of the cups are filled, leave them to harden at room temperature for at least 3 hours. Cups will keep in a covered container at room temperature for 2 weeks or in the fridge for 1 month. You also can freeze them for up to 3 months in a freezer-safe container or bag. Makes 30 11/2-inch peanut butter cups. Tint these melt-in-your-mouth mints in pastel shades, and they’ll look like teeny-tiny Easter eggs. They also look lovely sitting in a candy dish. Line a 9-by-13-inch baking pan with parchment. In the bowl of a stand mixer fitted with the paddle attachment (or in a large mixing bowl, using a handheld mixer), cream the butter and salt together on medium speed for 2 minutes. Add confectioners’ sugar, sweetened condensed milk, and peppermint extract, turn the speed to low and mix until the mixture gathers into a ball. Remove mixture from bowl, divide it into 4 portions and form each 1 into a ball. To color the mixture, add 1 drop food coloring to 1 portion, kneading to incorporate it evenly, then add more drops as necessary to darken the shade, kneading to incorporate the color thoroughly. Repeat with remaining 3 portions. One at a time, lay each portion on a work surface lightly dusted with confectioners’ sugar and roll by hand into a 1-inch-thick rope. Using a paring knife, cut into 1-inch-thick pieces. Layer the mints between sheets of wax or parchment paper in prepared pan, separating layers with wax or parchment paper. Cover mints with plastic wrap and refrigerate for at least 4 hours. Mints will keep refrigerated in an airtight container for up to 1 week.